You are here: Home / Health / Travel / Motorcycling Mecca! Best known as the host of the annual TT Races, when 40,000 motorcycle fanatics descend on this small, normally most tranquil of islands, the Isle of Man for much of the year is a sedate holiday destination in the Irish Sea. But come each May and June, the place explodes with visitors to the famous Tourist Trophy races around the 38-mile route on public roads that echo to the sound of throbbing engines and the smell of burning rubber. 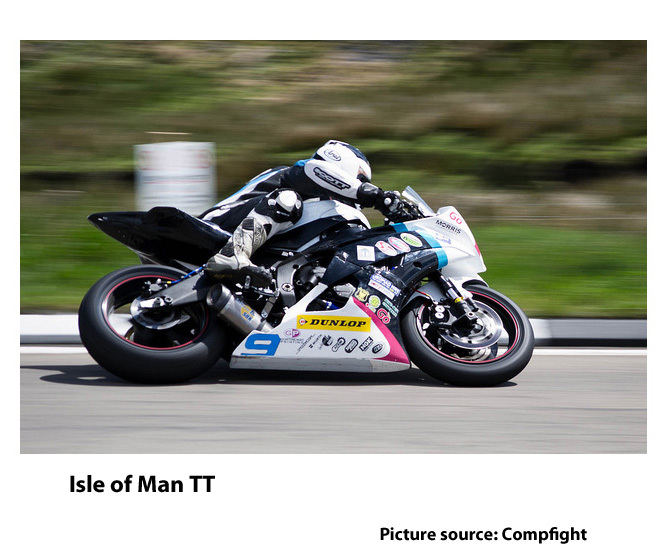 The Isle of Man TT dates back over 100 years, and is a Mecca for motorcycling fans around the globe, even though its status as the most prestigious motorcycle race in the world has lost some of its lustre in recent years. Downgraded from being a highlight of the FIM Motorcycle Grand Prix World Championships in the 1970s, it is now rather less grandly known as part of the Department of Tourism’s Isle of Man TT Festival…but that doesn’t detract from the excitement. The TT sees local roads closed to the public as racing bikes scream around the circuit at speeds of over 120 miles per hour. The very first race, in 1907, was won by a Matchless in the single-cylinder class and by a Norton in the twin-cylinder – at speeds of 38.21 and 36.21 mph respectively. The most successful rider in the history of the TT was the late Joey Dunlop, who won 26 times in various classes until his death in a race in eastern Europe in 2000. The Isle of Man has plenty for everyone to enjoy. The Laxey Wheel is the world’s largest working water wheel, and continues to turn even though today it serves no practical purpose other than to attract the tourists. Opened over 150 years ago to serve the local lead ore mines, the Laxey Wheel is known locally as the Lady Isabella, after the wife of the island’s governor the Hon. Charles Hope who first set it in motion at its inauguration. The Manx Museum is bursting with artefacts and unique treasures, including hoards of Viking silver and gold, and tells the Story of Mann and the history of Tynwald, the oldest continuous Parliament in the world. The Manx Electric Railway on the eastern coast connects Douglas, Laxey and Ramsey, and still operates with the majority of its original Victorian and Edwardian rolling stock. The Douglas Bay Horse Tramway has been in almost continuous existence since opening in 1876, and runs along the seafront for just over one-and-a-half miles. Snaefell – the highest mountain at 2,034 feet, from which, it is said, can be seen six Kingdoms on a clear day…the Isle of Man, England, Ireland, Scotland, Wales – and Heaven. It is about a 45-minute climb to the top. Ballaglass Glen is one of the most beautiful walks on the island, a former milling and mining centre which takes in spectacular woodland over 17 acres. The Road to Gull (Raad ny Foillan) is a long distance footpath which roughly follows the island’s 95 miles of coastline. 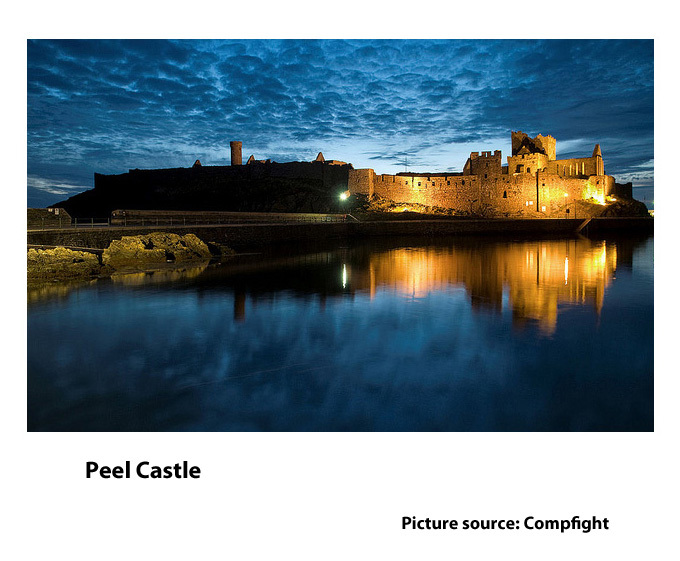 Peel Castle is believed to be the first site of Christianity on the island. It was originally constructed by the Vikings, and stands across a causeway on St. Patrick’s Isle – it has been proposed as a possible location of King Arthur’s Avalon. Castle Rushen is said to be one of Europe’s most finely preserved medieval castles and fortresses, and is still used today as a court house and museum. 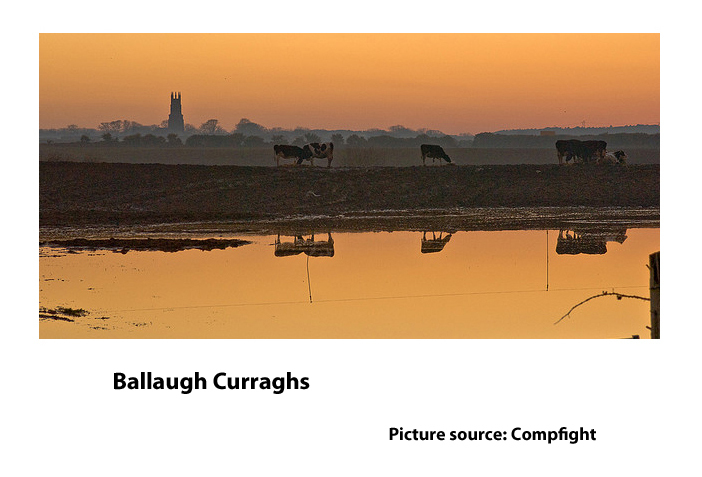 The Ballaugh Curraghs are wetlands in the north of the island, where a wildlife park and nature reserve play host to the second largest roost of hen harriers in Europe, along with peregrine falcons, merlins and its own sub-species of wren.